I don't cover digital comics as much as I should, but I do like to keep an eye out for new ideas. 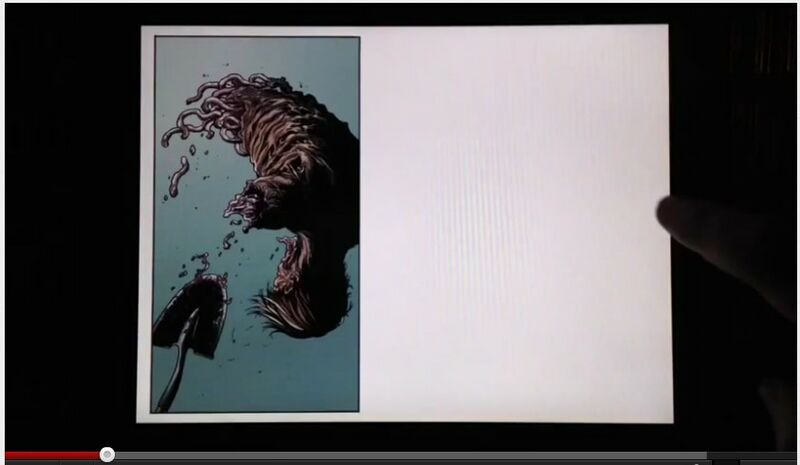 Mark Waid posted this video yesterday on InMediaRes. In case you're not familiar with Mark, for some time now he has been leading a team of artists in developing new digital comic ideas. The demo below is one example. As you can see, it's designed to work with a landscape view, not the portrait view of most paper comics. This concept explores how digital comic can use time to tell story. Tapping the screen advances the story and adds word balloons, new frames, and changes existing frames. It breaks with paper comics in a number of different ways, but it sticks with the concept of a finite page. There's no sign that if you change orientation that the content would shift. I'm not sure how much use this would be for different screen dimensions. This is interesting, but it doesn't blow me away like the demo I showed you last November. That was Pablo Defendini's work, and it's still impressive. Not as innovative but it still highlights that comics have a ways to go before evolving into a proper digital format. Hopefully we’ll see more experiments until somebody comes up with something compelling. Mark Waid is welcoming the future, but why has he grown disenchanted with the comics of his youth? Did the stories he love suddenly become less worthy now that digital delivery and new formatting possibilities are emerging? Whether a comic book used to be sold on a spinner rack, outdoor newsstand or specialty shop, it didn’t change the quality of the art and story. That is the point, and I believe Mr. Waid is missing that point big-time. Different ways to tell stories in a comic book type format, regardless of how it is delivered, does not magically create better stories, or artwork. And how much will he pay artists and writers if his comics are getting out there at $1.99 each? By his own admission, he had his chance at Boom to do something different, to get away from the standard superhero. But, it wasn’t until they started doing such comics that they started making money. I would politely suggest to Mr. Waid that great stories and art are not created by new delivery platforms and ’embracing the future’ means little without doing something worth paying even 99 cents.